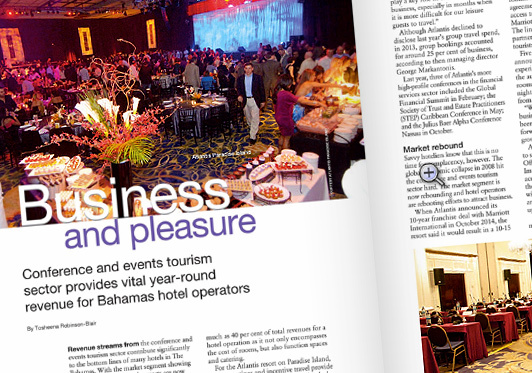 Revenue streams from the conference and events tourism sector contribute significantly to the bottom lines of many hotels in The Bahamas. With the market segment showing significant signs of growth, resorts are now refocusing efforts on group business. The Global Business Travel Association says group travel spending worldwide grew 5.3 per cent to $117.1 billion in 2014, surpassing expectations. A critical revenue stream, group business could account for as much as 40 per cent of total revenues for a hotel operation as it not only encompasses the cost of rooms, but also function spaces and catering. Although Atlantis declined to disclose last year’s group travel spend, in 2013, group bookings accounted for around 25 per cent of business, according to then managing director George Markantonis. Last year, three of Atlantis’s more high-profile conferences in the financial services sector included the Global Financial Summit in February; the Society of Trust and Estate Practitioners (STEP) Caribbean Conference in May; and the Julius Baer Alpha Conference Nassau in October. Savvy hoteliers know that this is no time for complacency, however. The global economic collapse in 2008 hit the conference and events tourism sector hard. The market segment is now rebounding and hotel operators are rebooting efforts to attract business. When Atlantis announced its 10-year franchise deal with Marriott International in October 2014, the resort said it would result in a 10-15 per cent increase in annual room nights, or an extra 50,000-100,000 rooms. Among other things, the agreement provides the resort with access to 45 million members of the Marriott Rewards loyalty programme. The line of thinking was that the partnership would drive more tourists, especially group business. Five months later, Atlantis announced its first-ever all-inclusive experience for groups for travel in the autumn, booking 10 or more rooms and staying three or more nights. The packages are available from 2015 to 2017. “We are very pleased that the group business is stronger now than it has been for the past two years and our forward-looking trends indicate this growth will continue,” says Burke. Atlantis’s conference facilities are able to satisfy the most discriminating clients. Offerings include the 50,000 sq ft Imperial Ballroom, which can accommodate groups up to 4,000; the 25,000 sq ft Grand Ballroom with limitless configuration options; and the Crown Ballroom for groups up to 1,450. The resort also boasts 34 break-out meetings rooms, seven boardrooms, and a number of hospitality suites offering state-of-the-art business docking stations, personal printers, flat screen TVs and an abundance of charging stations. Atlantis can also accommodate exhibition shows with up to 300 8×10 ft booths, secure storage for 10 containers, offer teleconference facilities and provide in-house audio-visual expertise, among a host of other capabilities. Another property incrementally growing its group business is the Meliá Nassau Beach Resort, formerly the Sheraton Nassau Beach Resort. The 694-room and 32-suites resort describes its group business as 10 or more rooms with meeting space, not including weddings. In 2012, the property hosted 62 groups. There was a slight uptick to 67 groups in 2013. In 2014, 71 groups stayed at the hotel. The hotel has five meeting rooms and a ballroom for group business to use. The property has hosted meetings as small as 20 persons and conferences with as many as 450 attendees. The maximum capacity for its meetings and events space is 1,200 persons. Last year, high-profile conferences held at the Meliá included the Small Island Developing States (SIDS) Tourism Conference in February. According to Johnson, the group travel spend depends on various factors including the size of the group, length of stay, average (room) rate and programme intensity. Rigorous meetings with very little, resort-hosted social activities mean less revenue for the resort. To attract local group business the hotel allocates marketing dollars to local newspapers, magazines, website banners and social media platforms. Repeat local business generates sizeable returns. Although there are no room nights involved, the food and beverage spend is significant. Now that the hotel is ramping up its efforts to become the only all- inclusive offering in the $3.5-billion Baha Mar development on Cable Beach, it is looking to attract even more business. In its transformation to an all- inclusive, Meliá will go up against SuperClubs Breezes, a pioneer in the all-inclusive model. Breezes Bahamas features 391-guest rooms and suites, with four restaurants and four bars. According to Zein Nakash, Breezes vice-spresident of marketing, the property works to ensure visibility amongst conference organizers and other decision makers via trade shows, mostly across North America. The resort’s perceived “great value” and the hotel’s ability to accommodate groups of varying sizes brings conference business to the property, she says. Breezes says it has hosted conferences and conventions for many Fortune 500 companies, although it declined to name them. Last year, the resort snagged the coveted privilege of host hotel for the IAAF World Relays. Approximately, 600 athletes from 43 countries participated in the meet. Despite such successes, however, competition for a slice of the event and conference tourism market on the Cable Beach strip is fierce. And it is about to get tougher. Not only does Sandals Royal Bahamian Resort and Spa offer meeting and conference space, but also the Baha Mar resort, which when completed, will boast one of the largest convention centres in the region. The megaresort’s meeting and event offering will come under the Grand Hyatt brand and includes 200,000 sq ft of state-of-the-art conference facilities. It encompasses 34 divisible rooms, including three ballrooms and 16 breakout rooms, offering around 82,000 sq ft of functional indoor meeting space. However, Nassau is not the only option in The Bahamas. Although some view out-of-town conferences as an excess, it can be a good way to get attendees “away from it all” and completely engaged with the conference’s agenda. There are several high-end resorts across the archipelago that offer conference facilities away from the distractions of the capital. As well as having the location on Cable Beach, Sandals also has suitable facilities at its luxury all- inclusive resort on Great Exuma. Sandals Emerald Bay has a dedicated conference centre with breakout meeting rooms, wifi, audio-visual equipment and a large ballroom that can be configured to suit the needs of the corporate client. One annual local conference held at Emerald Bay last year was the International Business and Finance Summit (IBFS). Put on by the Bahamas Financial Services Board (BFSB), the conference attracts around 150 attendees and is held at various locations on convention-friendly Family Islands such as Abaco, Bimini, Exuma and Grand Bahama. Hosting a conference of this size with international speakers costs $150,000 to $175,000, adds Comito. Expenses are underwritten by registrations and BFSB’s expenses are subsidized, in part, through sponsorships. “Actual BFSB budget is roughly a quarter of the expense in organizing and hosting the event, and depends on the number of international delegates we bring in,” Comito explains, but adds that the benefits to the attendees of holding a top-class conference in a beautiful, peaceful setting makes it worth the expense.